At the beginning of each half-day session, students at the new Milan Center for Innovative Studies (MCIS) gather on the Grand Stairs to discuss upcoming activities. What happens next is MCIS Director Kevin Upton’s favorite part of the day. If this does not sound like the start of a typical school day, it is because the Milan Center for Innovative Studies is not a typical school. 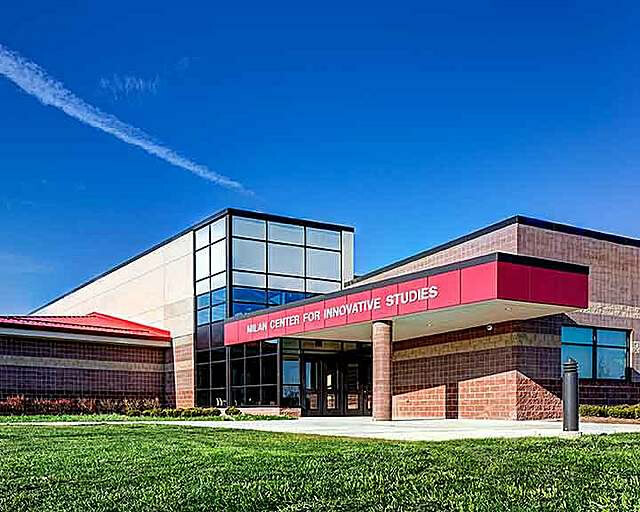 Designed as a 23,000-square-foot addition to Milan High School, MCIS supports a new project-based learning curriculum meant to prepare high school Seniors for the transition to higher education, post-secondary training, or the job market. 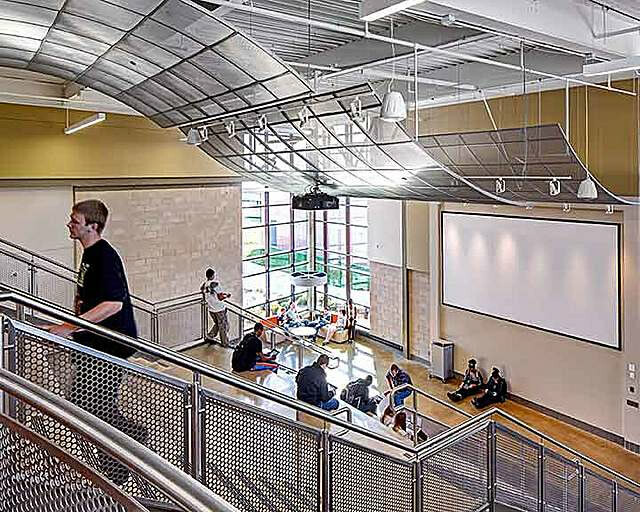 Since opening in 2012, the building has drawn visitors from across the state of Michigan and throughout the nation, thanks to its innovative curriculum and modern learning environments. For a building focused on innovation, MCIS has its origins in something much more traditional. 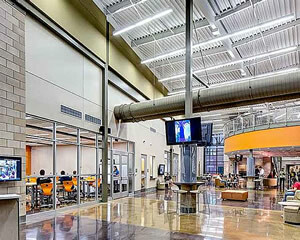 The addition was originally conceived as a vocational space meant to augment existing educational programs and relieve enrollment pressure at the high school. However, Milan Area Schools administrators soon chose to take another path, opting to create a new type of learning environment for their community. 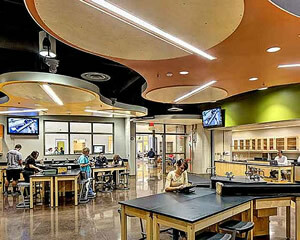 The design of MCIS perfectly reflects the District’s educational goals. The addition is created with the understanding that no one teacher or class “owns” a space. An open commons connects labs and support areas that serve multiple programs. Mobile furniture and an open arrangement of space allows the environment to take on whatever form is needed. A variety of gathering areas—ranging from the central Grand Stair to informal soft seating areas—encourage spontaneous collaboration. A robust technology infrastructure allows learning to occur primarily through school-provided laptops and tablets. They synergy between the built environment and the project-based curriculum is due, in part, to a robust planning and visioning process. A multi-day charrette involving District staff kicked off a year-long planning process which included staff interviews and tours of other schools across the country. To assist in the development of the project-based curriculum, the District hired Dr. Thom Markham, a former member of the Buck Institute for Education and co-author of the Project Based Learning Handbook. Over 12 months, Dr. Markham assisted with teacher and staff training, assessment design, and creating a project based learning portfolio for graduating Seniors. Design conceptualization and programming took place simultaneously, with curriculum development and staff training informing the evolving design concepts. 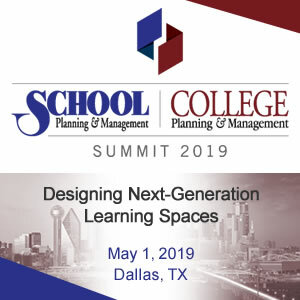 The primary challenge for the design team was to create a collegiate-type atmosphere that supports project-based learning. To achieve this goal, specialty labs, classrooms, and large group areas are knitted together to provide an educational environment that is greater than the sum of its parts. The facility is designed to maximize spatial agility and collaboration. The labs and support areas are meant to serve multiple programs and classes, as needed. 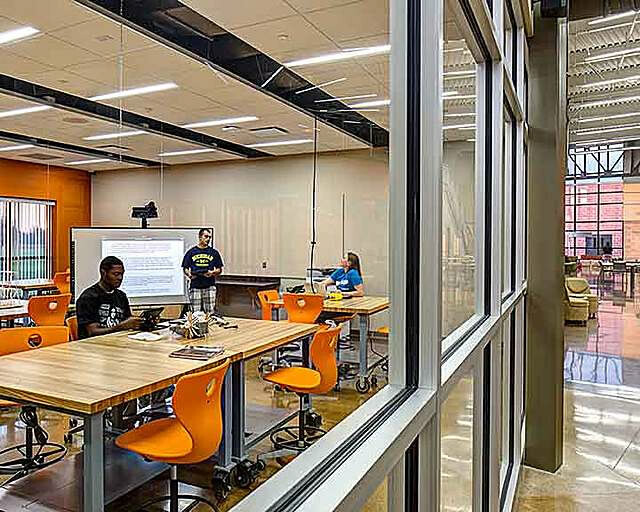 For example, students can conduct an experiment in the Exploration Lab, move across the hall to the Collaboratory to work on a project, and then break out into small groups in the Innovation Zone. All this is done seamlessly, with the facility being configured and reconfigured to meet whatever immediate needs students and teachers may have. Grand Stairs – The Grand Stairs acts as an amphitheater for group presentations and is also a popular gathering place throughout the day. 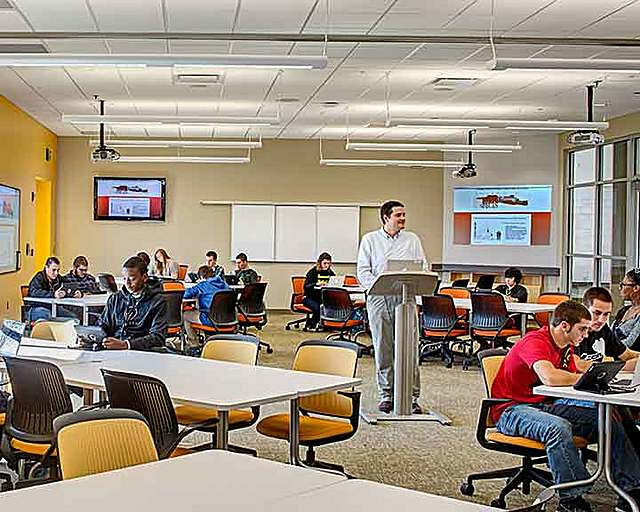 Collaboratories – Flexible instruction is provided through a pair of Collaboraties, which are based on the Steelcase LearnLab model. The spaces support omni-directional instruction and support testing, lecture, and group projects. Exploration Lab – The Exploration Lab is designed and equipped to fully support any science program: Chemistry, Physics, and Biology. Central islands are surrounded by movable tables and chairs. 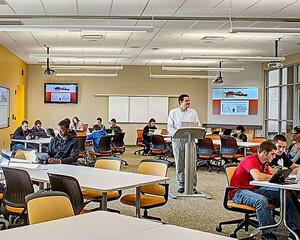 An open teacher demonstration space is supported by cameras and display monitors that allow students to see what is happening via several flat screen monitors placed around the room. Production Lab – The Production Lab allows students to move seamlessly from design to prototype production. Mobile butcher-block tables and suspended service lines support the reconfiguration of space for group projects. The Loft – A second-floor loft space provides an informal setting where students gather and enjoy snacks from the first floor student-run store. Located just outside staff offices, the space provides visual security of second-floor activities. Pod Bays – One of the most popular spaces on campus, the Pod Bays are a series of collaboration vestibules that allow students to share presentations through a central puck system connected to a large display monitor. "The Pods are great for collaborating,” says MCIS student Chance Davis. “They're perfect for group projects or just hanging out." To enhance the real-world applications of MCIS, the District has reached out to a variety of local businesses to discuss potential partnerships. For example, Ann Arbor SPARK, a non-profit organization focused on workforce development, will teach classes at the school. The University of Michigan has expressed interest in partnering with MCIS to provide opportunities for student teachers to try out new teaching methods. Other potential partners include Google, Toyota, and the Engineering Society of Detroit. Because students move spontaneously from space to space, security was a key concern. 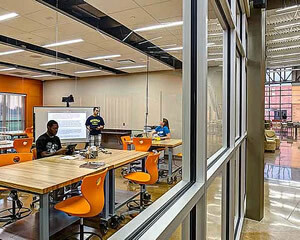 The design uses open configurations and glass walls to provide visual control of all learning areas. 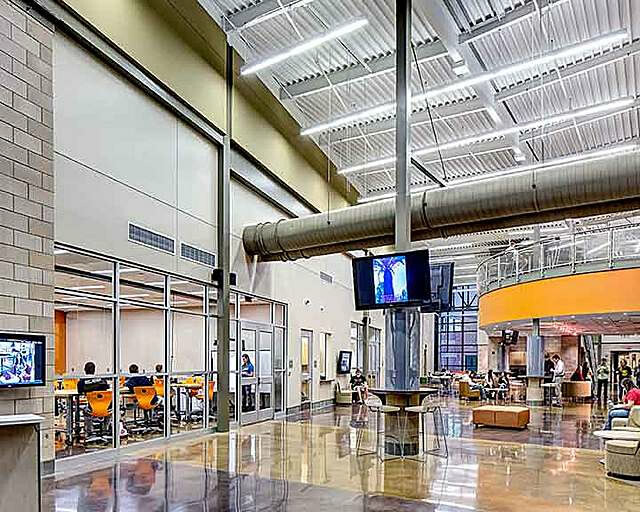 The extensive use of glass also adds to the sense of collaboration and connectedness among students and programs. Extensive use of windows and interior glass allows for the harvesting of natural day lighting and introduction of borrowed light into the labs. MCIS includes a new 3,500-squarefoot greenhouse. The space supports skill development in the rapidly growing field of sustainable agriculture. Water supply for the green house irrigation will be harvested to reduce water loss and manage run off from the structure. The contemporary design of MCIS reflects the progressive programs housed within the facility. Materials were selected based on their long-term durability and their ability to support space reconfiguration. As an addition to Milan High School, MCIS is strategically positioned adjacent to the existing Performing Arts and Athletic facilities. MCIS acts as a pre-function space for after-school events, with the Innovation Zone capable of supporting up to 130 people in a banquet-type setting. The location of the addition next to existing athletic fields and parking also encourages use of the building by the community after hours. The creation of MCIS is an exceptional investment in the long-term success of Milan Area Schools. Students and teachers agree that this is a school that instills a sense of pride, energy, and purpose. Student praise the facility for its innovative environments. Landscape Architecture: Michael J. Dul & Assoc. General Contractor: Clark Construction Company; Granger Construction Co.
Other: Peter Basso Assoc., Inc.